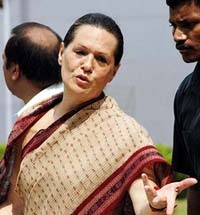 Congress President Sonia Gandhi said here today that the government would inquire into the confusion over the Muslim growth rate in the recently released census report. Congress President Sonia Gandhi addresses a press conference at ITI guest house, Rai Bareli, in Uttar Pradesh on Thursday. The Supreme Court today restrained the Centre from handing over the administration of the mid-day meal scheme to the states and Union Territories. However, the implementation of the scheme would continue to be in the hands of the states and UTs. Scores of Tibetan students of Sherab Gatsel Lobling School (Tibetan Transit School) were taken ill with suspected food poisoning today after they had their dinner in the school last night. Bharti Enterprises, the parent company of telecom brand Airtel, today announced the setting up of a $ 50 million joint venture with ELRo Holdings Limited for export of fresh fruits and vegetables from India to the European Union, United Kingdom, South East Asia, Gulf and CIS countries. 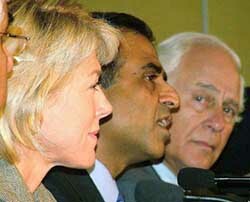 Sunil Bharti Mittal, Chairman and MD, Bharti Enterprises, flanked by Lady Lynn Forester de Rothschild, Director, ELRo Holdings, and Sir Evelyn de Rothschild addresses a press conference in New Delhi on Thursday. The organisers of ‘Ganesh chaturthi’ in this city are faced with an uphill task following a police directive and the Madras High Court order banning immersion in the sea, rivers and water bodies. The turban issue, has been solved amicably with all Sikh students, except three, returning to their schools, claimed the French Ambassador to India, Dominique Girard. “Only three cases remain pending today and dialogue is being pursued with the three students concerned,” he said in a communication to the National Commission for Minorities.